I am authorised by the Ministry of Truth to announce that victory over the mind is within our grasp. As you know, our organisations are proceeding fast to cancel out all forms of Thoughtcrime™. They are using their influence to block notorious antisocial elements (like the Russian saboteur Oleg Atbashian) from Facebook. We are succeeding with the implementation of NewSpeak version 15b, comprising gender-neutral pronouns. The production of Fake news by CNN has gone up 76% in all relevant sectors this past year. But now, thanks to new technology, we are nearing the final solution to the "think" problem. German engineers and Silicon Valley slaves interns have created a revolution in the printing industry. By adding certain pre-programmed nanobots to paper, it will be impossible to write down anything that is even remotely anti-progressive. This new technology will be called ProgPaper™. Combined with an equally important new socialist-ideas-only form of ink (called ThInkStop™, we are now able to prevent anyone on earth from writing down an idea we oppose. Soon, we will no longer need Facebook/Google/Twitter to use mind control. Even the conservative fools running illegal printing presses in the basements of their crumbling communities will create socialist propaganda, whether they want it or not. Every schoolbook, every groceries list, every birthday card will be used to spread our message. And then our victory over the mind will be finally complete. PS: I almost forgot to mention the best part: using ProgPaper is not monopolising! After all, you are still able to communicate by chiselling out stone tablets or by using smoke-messages. So conservatives shouldn't whine, right? If you don't like our ProgPaper, make your own parchment or write on animal skins. You're free to choose. Just like with facebook/google/twitter! 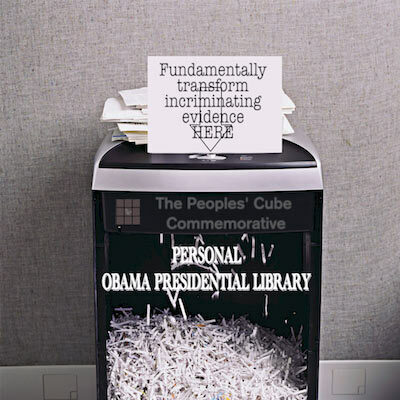 This is the best idea since the invention of the paper shredder for safe and secure archiving! While GoodThink at GoogleFacebookTwitter has almost completely taken over the digital means of information and eliminated nearly all CrimeThink, there still remains that annoying issue of hard-copy CrimeThink in the form of printed word in public libraries and private residences. I can see the day when GoodThink activists will be entering every single home for a mandatory spraying of people's bookshelves with ThInkStop. This will make progress irreversible and complete. Once that happens, the Glorious World of Next Tuesday will arrive at 12:00 am sharp. If Trump has created a booming economy and no media is there to report it, did it really happen? The hottest investment you can make today is the new Google subdivision called Google Minus, dedicated to deleting every instance of CrimeThink on your screens and hard copy until only GoodThink remains. In 2015, when forming its parent company Alphabet, Google dropped its old motto, "Don't be evil," and replaced it with "Do the right thing." I see two problems with that. 1. "Don't be evil" is a great motto because it sets the bar so low that it allows you to do pretty much anything that is unethical and douchebaggy - as long as it doesn't cross into being outright evil, like mass murder and genocide using chemical weapons. 2. "Do the right thing" is pointing in a direction that is diametrically opposite of progress. The korrekt motto would have been "Do the left thing." I hope dear comrades at Google take a note of it. "Do the left thing". You said it comrade square! But I forgot to mention the best part: using ProgPaper is not monopolising! After all, you are still able to communicate by chiselling out stone tablets or by using smoke-messages. So conservatives shouldn't whine, right? If you don't like our ProgPaper, make your own parchment or write on animal skins. You're free to choose. Just like with facebook! Equip Your Safe Space Today! Britain gets trigger warning: don't exit your safe space!